Finding a VPN that protects your identity online while still offering access to streaming content and geo-restricted services is difficult. With so many similar options, we decided to help users by comparing services. Read our review to see which one of our two contenders came out on top! A rapidly rising number of available options makes it hard for users to compare VPN services. Some offer better security and privacy features, while others focus on speed and access to geo-restricted services. Though it may not be easy, this should not stop you from finding the right VPN to fit your needs. Our team of tech experts decided to run a VPNs comparison to help our users find the best possible solution. We’re testing SaferVPN and NordVPN today, two providers that are well-known in the industry. Our experts test each VPN meticulously to determine a winner. We examine a variety of features such as pricing, encryption protocols, speed, and more. Furthermore, we also consider firsthand experiences users have had with each of the service providers. Read on to see how each company tested in our VPN comparison! Accessibility is a key component in our comparisons. How well users can connect across servers and devices is a vital consideration. To meet user needs, NordVPN has over 2,600 servers worldwide and offers unlimited bandwidth. The company supports Linux, Chrome, Android, iOS, Mac, and Windows, as well as 6 simultaneous connections. SaferVPN lags its rival with 700 servers around the world, though it also offers unlimited bandwidth. There are apps available for the same companies as its rival’s and for routers, as well. Users can sign into the service from 5 devices simultaneously. Available Streaming Services. The ability to access geo-restricted streaming services is a major reason people use VPNs, and figures largely when we compare VPN providers. NordVPN grants its users access to Netflix and similar services such as Hulu and Amazon Prime, while SaferVPN keeps pace with similar access across servers. Mobile Apps. It’s important to protect mobile devices as well when connecting to unsecured public networks and browsing the web. 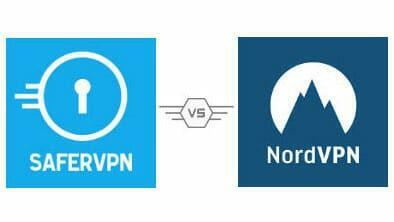 NordVPN and SaferVPN each host applications for Android and iOS smartphones and tablets. Protocols. VPNs offer different protocols to users to allow them to personalize their security, privacy, and speed. To ensure the safety of its customers’ data, NordVPN uses encryption algorithms IKEv2 and IPsec, both known for their high security marks. SaferVPN works with the same protocols, and goes a step further with the industry-standard OpenVPN, which is known for reliability and speed. Kill Switch. In cases where a secure VPN connection fails, a kill switch allows you to quickly disconnect and avoid any exposure. NordVPN provides this feature, as does SaferVPN. Money Back Guarantee. A generous refund policy is a fantastic way to test a service for fit and satisfaction with little risk. NordVPN and SaferVPN each abide by the 30 days refund policy, which is standard in the market. Speed. While some VPNs affect connection speeds, the best providers avoid this and offer fast browsing and downloads. SaferVPN tested well, offering above average downloads across international servers. NordVPN, unfortunately, was found to affect connection speeds somewhat, though downloads remained fast. The safety and anonymity of the clients should be every VPN service provider’s core values. To satisfy these needs, SaferVPN presents three popular encryption algorithms, and provides a kill switch function to ensure the integrity of a secure connection remains uncompromised. SaferVPN does, however, log users’ activities to improve their services. While this may be a turnoff for some users, the company is very transparent about its policies. By comparison, NordVPN also uses a set of encryption algorithms and incorporates the must have kill switch option. The company takes this category, however, thanks to its strict zero-log policy, which is a must for security-oriented users. Having access to a trained support team is a hallmark of a great VPN service. SaferVPN’s customer service and support team are available via a live chat or ticket-based email system 24 hours a day, 7 days a week. Representatives answer quickly and do their best to assist. Comparatively, NordVPN’s team can be reached via regular mail, email, or an e-form. The staff answers quickly, and is available around the clock, as well, though not having an instant communication feature like live chat may not be preferable for some users. Pricing factors heavily into our VPN comparison, as providers must offer features as well as value. SaferVPN has three subscription plans, which include a monthly $9.99 plan, a 1-year plan for a monthly $4.99, or a 2-year plan for $3.49 each month. Also included in all their plans is a 30-day money-back guarantee. NordVPN has four subscription plans: a two-year plan for $3.99 each month, a one-year plan for $6.99 a month, or a monthly subscription for $11.95. The company accompanies their solutions with a 30-day refund policy, echoing SaferVPN. While our team of VPN experts enjoyed both services and recommend each of them, we have a clear winner: NordVPN. The company’s server locations, security features, and customer service paired with bargain prices are hard to come by. However, SaferVPN is still a good solution for users seeking blazing fast speeds and customizability. If you would like to pick which brands we test for our next VPNs comparison, write us a comment on the names below!